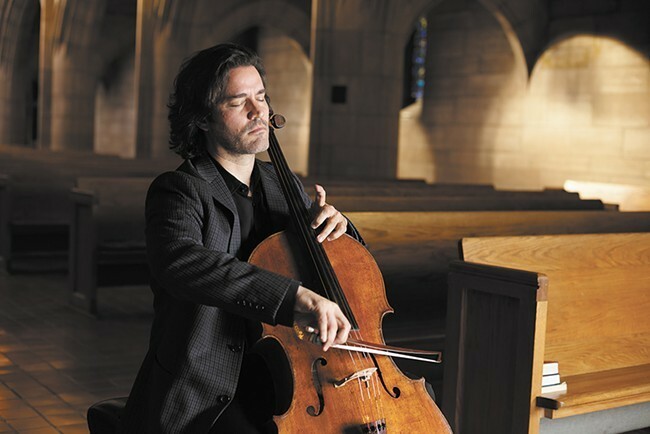 Northwest Bach Festival's Zuill Bailey at St. John's Cathedral. Forget all the disappointing Grammy announcements this morning — we're stoked for Sturgill Simpson, but expected even more Bowie and Kanye and far less Drake and Justin Bieber — one of our community's own was included in a classical music category. Zuill Bailey, the Northwest Bach Festival's artistic director for the the last three years, was nominated for the best classical instrumental solo Grammy. This is the cellist's first nomination. Among the category's four other nominees, Bailey was the only cellist selected for this year's honor. What landed Bailey this distinction was his live performance recording of Michael Daugherty's newest concerto for cello and orchestra, Tales of Hemingway. Bailey not only premiered the work with the Nashville Symphony, conducted by Giancarlo Guerrero, but he also worked with the composer for more than two years to perfect the nuances of the contemporary piece, which weaves four of author Ernest Hemingway's classic works into song. Winners will be announced at the Grammy Awards ceremony held February 12. While Bailey doesn't live in Spokane, as he's also artistic director for music festivals in El Paso, Texas, and Sitka, Alaska, he comes through town quite often, including this weekend. Hear Bailey, who was also recently named a 2016 Musical Innovator by Musical America, perform as part of the Northwest Bach Festival winter series. Surprisingly, none of his performances, either at Hagadone Event Center in Coeur d'Alene or Barrister Winery in Spokane, will feature a Bach composition. Get tickets here.